For other Superman video games, see List of Superman video games. Superman: The New Superman Adventures, commonly referred to as Superman 64, is an adventure video game developed and published by Titus Interactive for the Nintendo 64. The game is based on the television series Superman: The Animated Series. Superman was released in North America on May 31, 1999 and in Europe on July 23, 1999. It is the first 3D Superman game. Development of the game was largely hampered by constraints from DC Comics and Warner Bros., resulting in it being unfinished and of a poor quality. BlueSky Software attempted to re-do the game for the PlayStation, but due to Titus' expiration of the Warner Bros. license by the time it was completed, this version ultimately got cancelled. In the game, Superman must rescue his friends from Lex Luthor, who has trapped them in a virtual version of Metropolis. The game is infamous for the very negative reception it received from critics and is widely considered to be one of the worst games of all time, being heavily criticized for its poor controls and graphics, technical bugs, repetitive gameplay, and difficulty. Superman is a three-dimensional action-adventure platformer set in a virtual recreation of Metropolis created by Lex Luthor. Virtual Metropolis is filled with what the developers call "Kryptonite fog" in an apparent effort by Lex Luthor to diminish Superman's abilities (which is actually distance fog and is used as a technique to mask the game's poor draw distance). In the main single-player mode, the player assumes the role of Superman, who is challenged by Luthor to complete various tasks and puzzles. Superman can walk, fly, combat enemies, and use super-strength to lift and carry large objects. Superman's other superpowers, such as Heat Vision, Freeze Breath, and X-Ray Vision, are only accessible through collection of power-ups in certain levels and have limited reserves. If Superman is attacked by enemies, hazards, or is in close proximity to Kryptonite, his health will decrease. The player will enter game over (indicated with "LEX WINS") and will be required to restart the current mission if Superman loses all his health. The player will also enter game over if a civilian character is attacked or time limits imposed on various missions expire before they are completed. Superman contains fourteen distinct levels, which consists of seven "Ride Levels" and seven "Maze Levels." In Ride Levels, gameplay is set outdoors in Metropolis, and alternates between flying Superman through a series of colored rings and then completing a timed objective, such as protecting a civilian character or defeating all the enemies. When flying through a ring section, the player is given a time limit to complete the run that ranges from one to ten minutes. Missing three rings, running out of time, or failing the timed objective that immediately follows means the player must restart the ring section. In Maze Levels, Superman has uncovered one of his friends from within one of Luthor's outposts, and must escape with them and defeat a boss. These levels are generally more rooted in action-adventure, and make use of puzzle-solving. The game includes two multiplayer modes (a racing mode and a battle mode) that can be played with up to four people. In the battle mode, players must defeat their opponents by throwing various weapons and items at them. In the racing mode, players control a spaceship and rings shoot from the backside of one opponent. Lex Luthor has created a virtual version of Metropolis and manages to trap Lois Lane, Jimmy Olsen and Professor Emil Hamilton within it. Superman enters the portal to the virtual world, where Luthor tells him that he must fly through his maze of rings scattered across virtual Metropolis. After completing the rings task, Superman realizes he must save his friends from the virtual realm. Villains he battles along the way include Parasite, Darkseid, Brainiac, Mala and Metallo. At the end of the game, Superman frees his friends from virtual Metropolis, but Lex manages to escape, ending it on an unresolved cliffhanger. Superman was developed by French developer Titus Interactive and took two years to make. In early 1997 Titus signed a licensing deal with Warner Bros. to make games based on Superman: The Animated Series for the Nintendo 64, PlayStation, Sega Saturn, and Game Boy. The Game Boy game was completed and released by the end of the year. The Nintendo 64 game was first unveiled at E3 1997 and later shown at E3 1998. Eric Caen, the game's producer and co-founder of Titus Software, stated that the main goal of development was to create the first "superhero-based" video game where players really behave as a superhero. The game features sound bites of voice actors and actresses from Superman: The Animated Series: Tim Daly as Superman, Clancy Brown as Lex Luthor, Dana Delany as Lois Lane, David Kaufman as Jimmy Olsen, Victor Brandt as Professor Emil Hamilton, Corey Burton as Brainiac, Malcolm McDowell as Metallo, Brion James as Parasite, Leslie Easterbrook as Mala, and Michael Ironside as Darkseid. Caen stated in a 2011 e-mail interview with internet personality Jon "ProtonJon" Wheeler (who conducted the interview for his ongoing Let's Play of Superman) that development was heavily affected by Superman licensors DC Comics and Warner Bros., who mandated numerous aspects of the game design. These aspects included the limited use of Superman's powers and the game's setting in a virtual world, which was due to the desire to not have Superman fighting "real" people. The game's release was delayed by six months due to a lengthy approval process and less than ten percent of the original design was implemented in the final product. Caen also commented that the original design was "too ambitious compared to what an N64 was able to deliver." After the critical failure of the N64 version, Titus gave BlueSky Software the reins to completely redesign Superman for the PlayStation. The game received approval from Sony, but the license from Warner Bros. had expired and Titus was unable to secure a new one, resulting in the game's cancellation in 2000. Despite that pre-release reception was positive, Superman was heavily panned by critics, holding an overall negative score of 23% at GameRankings based on 10 reviews, and is often cited as one of the worst video games ever. Complaints were directed towards the game's controls, graphics, and general gameplay. Superman's flying controls were heavily criticized by multiple critics for being unresponsive, sometimes requiring multiple button presses for taking off or landing. Matt Casamassina of IGN rated Superman 3.4 out of 10, speculating that the developer had not "put forth any priorities for this title other than to finish it" and commenting that the game has a "rushed, careless feel." Casamassina states that this feel "overflows into its visuals," criticizing the inconsistent frame rate, excessive use of distance fog, and frequent clipping seen in the game's environments and objects. He also criticized the game's poor collision detection, abundance of bugs, and poor enemy AI. Casamassina concluded the review with "[Superman] is executed so poorly that it actually serves to butcher the reputation of the prominent action hero." Joe Fielder of GameSpot regarded the graphics as "subpar, even for a first generation N64 game." Fielder gave the game a score of 1.3 out of 10, making it the fourth lowest rated game by GameSpot, declaring that "This is easily the worst game I've ever played... it serves no purpose other than to firmly establish the bottom of the barrel". Conversely Nintendo Magazine System, the official Nintendo magazine of Australia, gave the game a ranking of 80%, stating that complaints about steering Superman as he flies were unwarranted as it was simple if the player reads the instruction manual, though concluding the game was less than they expected overall, with complaints about the fogging and ease of the game's missions. Jevon Jenkins at Game industry News (GiN) gave the game 3​1⁄2 out of 5, stating that the graphics improve as the levels progress, gameplay may need some work but can become fun after some experience, and complimenting the sound. Brazilian magazine SuperGamePower gave the game 3.8 out of 5, criticizing the movement but praising the powers. Despite the largely negative reception from critics, according to Titus, consumer feedback obtained in the form of a mail-in registration was "overwhelming positive," and "More than 70% of Superman's target audience, that of 6 to 11-year-olds, rated the game as an 'A' title." IGN described this positive reception as "baffling" and said that they were "at a loss for words." Despite its critical reception, NPD Group data shows that Superman was a top seller in North America during the month of June 1999. In July of that same year, Titus announced that Superman had been the third best selling game for the N64. Over 500,000 units were sold. The game was rated as number seven in the list of "20 Worst Games of All Time" in a list created by Seanbaby in Electronic Gaming Monthly. It was also named second in the G4 series Filter's "Top 10 Worst Games of the '90s". Nintendo Power magazine rated it as the worst game on a Nintendo system. On MTV's Gamer's 2.0, it was rated the No. 1 worst game of 1999. The game also topped GameSpy'}s list of the ten worst comic book based video games, as compiled by journalist David Chapman. On GameTrailers, it was ranked No. 1 on their 'worst game of all time' list in 2006, just ahead of E.T. the Extra-Terrestrial for the Atari 2600. The game was featured in the Guinness World Records Gamer's Edition 2009 book for lowest rated superhero game. WatchMojo.com ranked the game number one on their Top Ten Worst SuperHero video games list and number two on their Top Ten Worst video games of all time list. A number of issues following the release of the game, the British and Australian Nintendo Official Magazine featured a tongue-in-cheek maze game presented by Lex Luthor entitled Lex Luthor's "Solve My Maze" after his words in the game's infamous "hoop" sections. ^ a b c d Casamassina, Matt (June 2, 1999). "Superman Review". IGN. Retrieved December 16, 2012. ^ a b Superman: The New Adventures (Instruction manual). Titus Software. May 29, 1999. NUS-NSPE-USA. ^ "Inside Scoop". GamePro. No. 103. IDG. April 1997. p. 20. ^ IGN Staff (March 27, 1998). "Superman is Clark Kent!". IGN. Ziff Davis. Archived from the original on October 27, 2015. Retrieved October 27, 2015. ^ Caen, Eric (May 6, 1998). "Eric Caen of Titus Software". IGN (Interview). Interviewed by Matt Casamassina. Ziff Davis. Archived from the original on October 27, 2015. Retrieved October 27, 2015. ^ Caen, Eric (January 7, 2011). "An Interview With Eric Caen" (Interview). Interviewed by Proton Jon. Proton Jon's Blog. Archived from the original on June 3, 2015. Retrieved October 27, 2015. ^ "Superman". The Official PlayStation Museum. Archived from the original on May 2, 2015. Retrieved October 27, 2015. ^ "The New Superman Adventures". Nintendo Power. Nintendo of America. 115: 101. December 1998. ^ GameWeek Staff (October 15, 1998). "Man of Steel Makes History". GameWeek. Cyberactive Media Group. 4 (17). ^ a b "Superman Reviews". GameRankings. Retrieved May 27, 2012. ^ Marriott, Scott Alan. "Superman [N64] - Review". AllGame. Archived from the original on November 13, 2014. Retrieved July 4, 2015. ^ "Superman (N64)". Electronic Gaming Monthly. 1999. ^ Reiner, Andrew (August 1999). "Superman (N64)". Game Informer. No. 76. p. 64. Archived from the original on March 1, 2000. Retrieved October 19, 2013. ^ a b Leong, George (July 1, 1999). "Superman Review". Game Revolution. Retrieved December 16, 2012. ^ a b c Fielder, Joe (June 8, 1999). 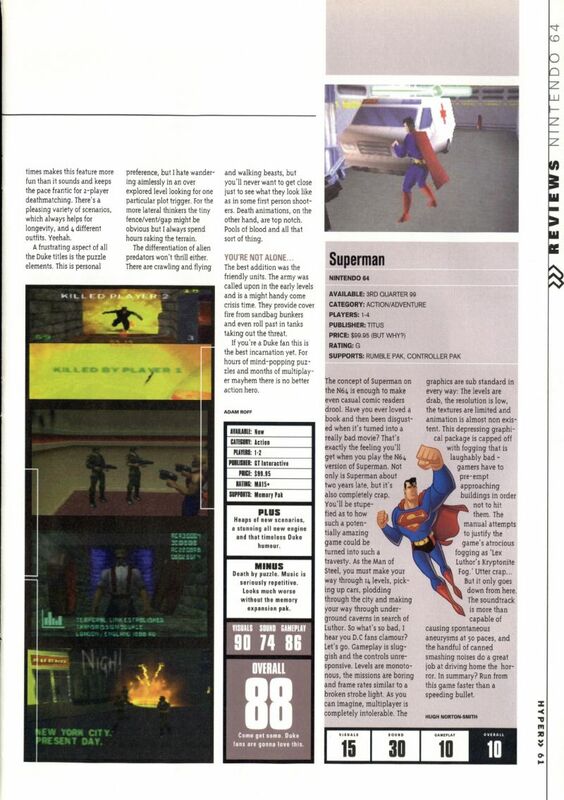 "Superman Review for Nintendo 64". GameSpot. Retrieved December 15, 2012. ^ Norton-Smith, Hugh (September 1999). "Superman". Hyper. No. 71. p. 61. Retrieved September 13, 2018. ^ Weaver, Time (August 1999). "Superman Review". N64 Magazine. No. 30. Future Publishing. ^ "Superman (N64)". Nintendo Power. 122: 116. July 1999. ^ a b Mathias, Lord (July 1999). "SUPERMAN". SuperGamePower (in Portuguese). p. 30. ^ "Superman". Nintendo Magazine System (77): 33. August 1999. ^ a b "Superman Flies off Shelves". IGN. July 8, 1999. Retrieved December 18, 2011. ^ IGN staff (June 15, 1999). "Superman Enjoys Super Sales". IGN. Retrieved May 14, 2010. ^ IGN staff (July 1, 1999). "Superman Flies with the Big Boys". IGN. Archived from the original on March 7, 2002. Retrieved May 14, 2010. ^ "Interview: Eric Caen. Crazy Cars, Superman 64, and Back! - Retro Gaming Magazine". Retro Gaming Magazine. June 25, 2016. Retrieved December 11, 2017. ^ Riley, Sean. "Seanbaby's EGM's Crapstravaganza: The 20 Worst Video Games of All Time". Seanbaby. Retrieved December 27, 2013. ^ "Top 5 Worst Games Ever". Nintendo Power. Nintendo of America. 196. October 2005. ^ Chapman, David (July 18, 2004). "Comics to Consoles: Part II – When Good Comics Go Bad". GameSpy. Retrieved August 4, 2007. ^ "Top 10 Best and Worst Video Games of All Time". November 17, 2006. Retrieved June 28, 2008. ^ Paradis, Dan. "Top 10 Worst Superhero Video Games". WatchMojo.com. Retrieved October 15, 2016. ^ Paradis, Dan. "Top 10 Worst Video Games Ever". WatchMojo.com. Retrieved October 15, 2016.